Advanced Cymatic Trader is Completely FREE to use! It is unique betting and trading software for Betfair, enabling the fastest possible bet placement and management. FREE to use - no catches or restrictions. Certified by Betfair - security tested and approved by Betfair. Compatible with Betfair's new system. Unbeatable speed - super fast trading on Betfair. Training Mode (Demo) - an option to practise without risking real money. 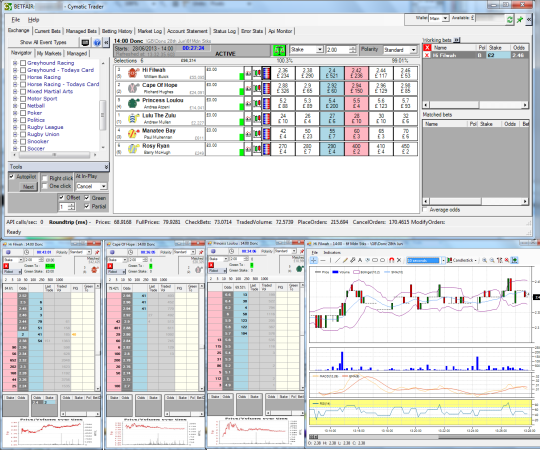 Grid Interface - single click trading, compact Betfair-style trading grid. 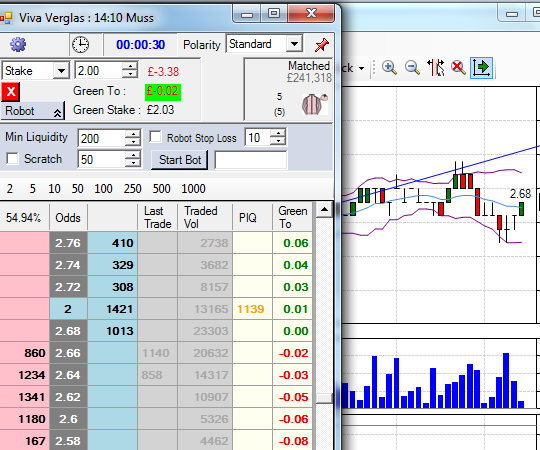 Ladder Interface - full depth of market, single click trading, queue position (see below) and built-in robot. Position In Queue (PIQ) - provides a real-time estimated PIQ, arguably the most important and unique feature of our ladder! Automated Trading Robot - included is a unique Betfair bot, watch it trade on the ladder for you! Multi-Market - trade several different markets simultaneously. 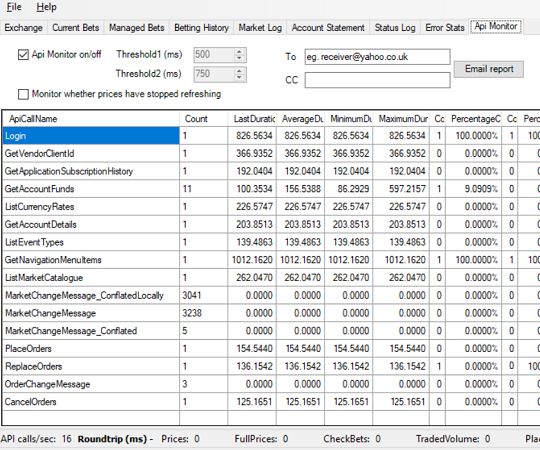 Managed Markets (Guardian) - works in the background to gather data from multiple 'managed' markets and maintain offset bets. My Markets - a list of markets that you have bookmarked. Tick Offset - automatically sends an opposing bet, after you get matched. Stop Loss - automatically limits your losses. Trailing Stop Loss can also protect profits. Greening (Cash-out) - a single click to lock in your profit (or loss) regardless of the outcome. Racing Autopilot - it can automatically select each horse race and move forward. Football Odds Predictor - calculates the expected odds statistically, to help you identify trading opportunities when market prices are misaligned. 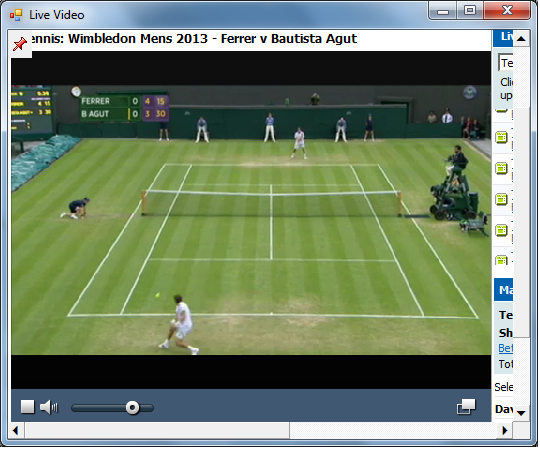 Betfair Live Video - watch live sporting events in a compact resizeable window. 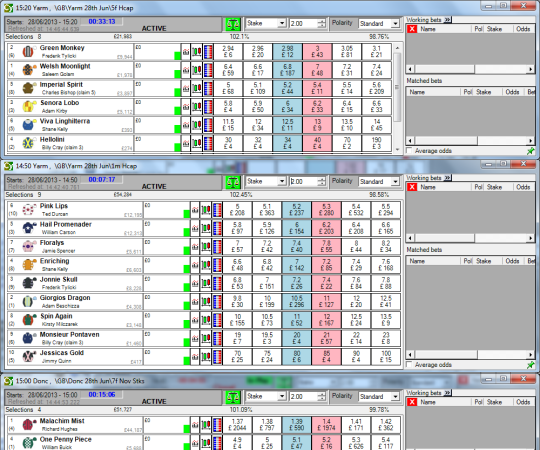 Advanced Charts - possibly the most comprehensive integrated charting available in any Betfair application. 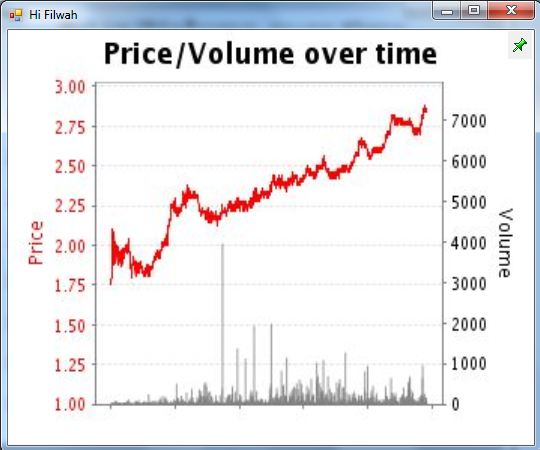 Betfair Charts - automatically refreshing Betfair price/volume charts. Customize - easily customize ladders and charts. Save unlimited layouts to files. Choose colours. API Monitoring - for real-time overview and management of internet and exchange issues. Instant Email Notifications - of errors and API Monitor reports. Supports multiple monitors - perfect for viewing multiple ladder windows. All market types - works with all Betfair market types. 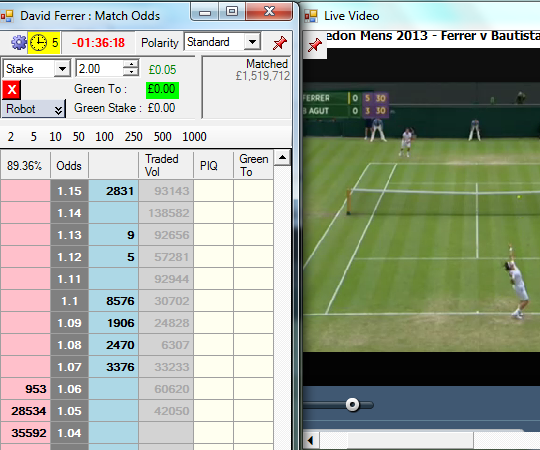 Accounting - downloading/filtering of betting history and account statements. Intuitive - designed for professional traders, but easy for novices too. Languages - English, Portuguese, Russian. Advanced Cymatic Trader is popular with traders in many countries around the world, but not just because it is FREE. It was the first Betfair software to reveal the PIQ (estimated Position In Queue) which is now regarded as essential by many traders. 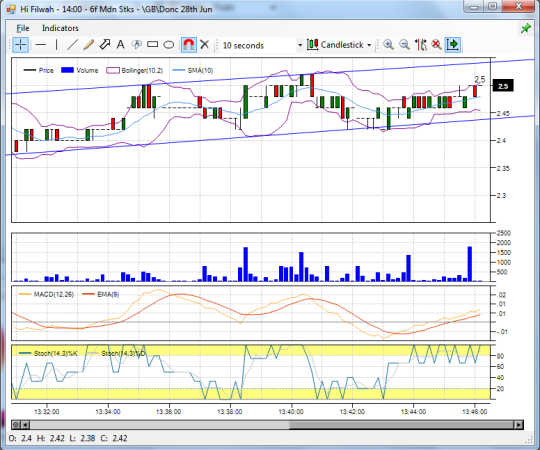 It was also the first to introduce advanced charting with the ability to draw magnetic trend lines. There are a number of other innovative features not seen before, such as a robot integrated into the ladder and the advanced API Monitoring. The 'API Monitor' feature can instantly reveal errors or bottlenecks caused by the internet or the exchange. Critically, it helps you avoid trading during bad periods, that other traders may be often be oblivious to. It is just one of the unique features designed for professional traders but equally welcomed by novices. Take your Betfair trading to another level - Download now!